Manjiri shares a simple and delicious spicy fish curry recipe which can be rustled up in a very short time. Nothing makes me feel more at home than a good old spicy fish curry. Normally I would pick fish like Bombay Duck or the white Pompfret which are available in abundance in Mumbai, but the frozen fish which I buy from Indian stores here just doesn’t have the same fresh taste. So I turn to the great variety of fresh fish available to us in Britain which leaves one spoilt for choice. I am quite a fan of lemon sole, sea bass, haddock and of course salmon. But for this curry I use Tilapia, a white fleshy fish, which is not only a really tasty fish, but it takes to Indian marinades very nicely. The use of freshly grated coconut in our curries is a very coastal thing because coconut trees are plentiful in the gorgeous coasts of Konkan. 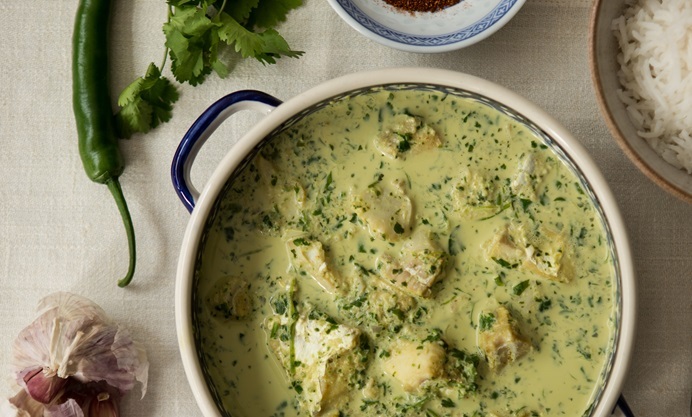 Besides being a gravy thickening agent fresh coconut combined with slightly roasted red onion gives a very rich, creamy and good base for a fish curry. In case you do not have access to freshly grated coconut, a pouch of the condensed coconut milk from Pataks does the trick or even a quarter of a can of coconut milk will work. The difference is that grated fresh coconut makes a very thick and tasty puree whereas a pouch or can will give a milky base somewhat like a Thai curry. The trick is to balance the alternative ingredient with the right amount of spice or heat to get just the right taste. This simple and delicious fish curry is part of our staple diet and we have it at least twice a week back home. 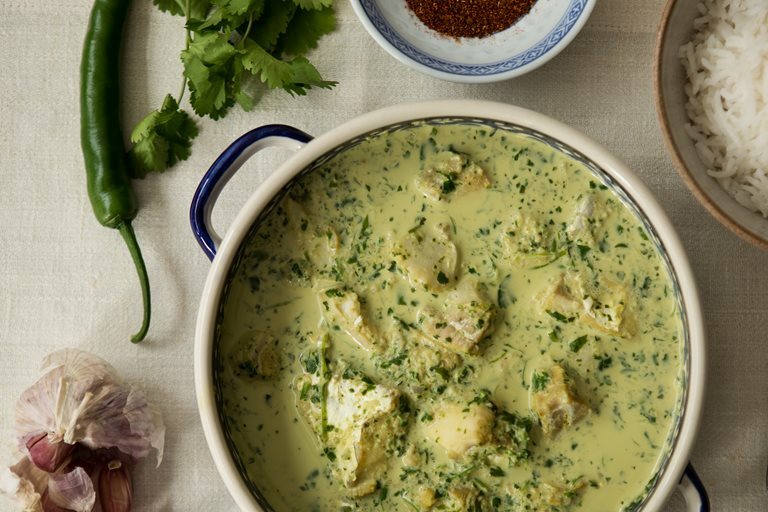 I always store some of the green marinade and the coconut and onion paste in the freezer and save for the day when I really crave the taste of Mum’s traditional fish curry. Manjiri is an Indian food blogger currently living in London.